I don’t even know where to begin in writing this post. It’s been on my mind all week as this Mother’s Day has slowly approached. I am going to try as eloquently as I can try to put in to words what I’m feeling and I hope you can follow along. You see up until this year I wasn’t a Mom yet. Up until this year, Mother’s Day was tainted with the memory of my biological father’s suicide. I don’t want to get in to all that, but to provide a little back story for those that aren’t already aware, this devastating news was delivered via a phone call that would forever change my life on Mother’s Day when I was 15 years old. I don’t think of it often and throughout the year(s) it’s almost like a distant memory that happened in someone else’s family, not mine. But on this day, and this day only, the memory flashes back and it makes me nauseous and has every year since. I guess I should say made me nauseous, as in past tense. I say that because this day is forever changed for me from now and for the rest of my life and I can’t even express how blessed and grateful I am for that on so many levels. You see this year is the first Mother’s Day that I’m a Mom. A parent. Someone’s Mom. I still can’t even believe it. Typing and reading the words still seem so unreal and untrue yet they are so amazingly true and real. 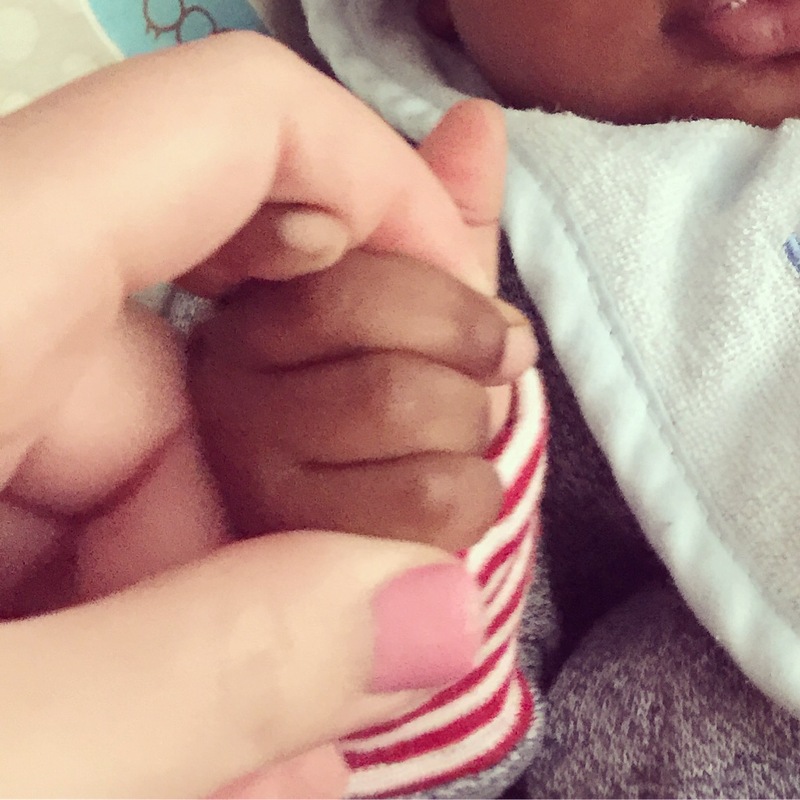 On February 6th, 2017 our lives were forever changed when our local Department of Social Services brought us the most beautiful creature I have ever seen, our foster son whom we affectionately call “Baby K” whom was only 3 weeks old. I can still remember exactly what he was wearing and exactly how he smelled that day he arrived at our home. I was immediately smitten with this amazing tiny human being and sometimes still forget I didn’t actually give birth to him myself, even when it’s blatantly obvious that our skin tones are different and being that it is totally visually apparent resulting in stares in public, assumptions about whom his dad might be, and many other stereotypes and well meaning yet rude comments from strangers that I don’t care to get in to. My point is that I have never experienced the wave of emotions and the automatic motherly instincts that took over my body that day. It was totally different than how it felt when we received our first temporary placement (a 3yr old girl whom we knew from the beginning would only be with us for a brief time). It was overwhelming the rush of emotions that swept through me that day and continue to do so each and every day as he ages. Feelings of fear, anxiety, inadequacy, abundant love, compassion, and instincts to defend and protect just to name a few. There has never been so much truth in the term “Mama Bear” as there is for me now. It was exactly like that, a new Mama Bear 🐻 completely smitten with her new Baby Cub. On this day this year, I am so grateful to have been chosen by God to be Baby K’s Mom, whether that be temporarily or for the rest of his life. I am feeling emotions and love that I never knew was possible and in parts of my heart I didn’t even know existed. I am feeling hopeful that God’s plan for Baby K’s future, no matter what it might be, will be His will, but I’d be lying if I said I didn’t secretly hope that God’s plan was for him to legally become ours. It makes me feel selfish to admit that out loud but he is my cub forever in my heart no matter what happens, for this I know is true. From this day forward I will know and understand what being a Mom is all about, how it changes your very core and your mind and heart forever. I will remember the precious moments I have shared with my Baby Cub these last three months (he just turned 4 months last weekend). I will remember experiencing all his “first” milestones of development, and seriously there has been so many in such a short amount of time, who knew! I will cherish in my heart the way his face lights up in a big bright smile when he hears my voice. I will emblazon in my mind the look of love, innocence and adoration I get to witness when I look in to those beautiful baby brown eyes of his and he looks back at me. I am forever changed. I will never forget no matter where God takes us on this journey these feelings, these moments and this precious soul. He will always be the one that changed me and for that I am truly blessed and thankful. He is my Cub forever and I can’t believe God chose me. I am truly honored and vow to do my best to protect and love him for the rest of my life. As I type this he is asleep in my arms after a middle of the night feeding. I want to freeze this moment in time so I can remember it always. The milk smell on his breath from his bottle and the scent of lavender from his baby shampoo I want to bottle up and smell forever as it’s the most magical and precious fragrance I’ve ever smelled. My first Mother’s Day…I want to remember it and cherish this moment forever and always. Rite Aid Steal Deal Alert!